Even though animated sequels are commonplace in this day and age, Walt Disney Animation Studios – the world’s most famous source of animated features – rarely creates follow-ups to their animated classics. Some might be quick to point out the flood of direct-to-video Disney sequels that plagued the 90s and early 2000s, but those were actually produced by the now (mercifully) defunct DisneyToon Studios. Those were products of their time, and never once have those straight-to-video sequels been considered a part of the official Disney Animation canon. The beloved studio’s only true animated sequels are The Rescuers Down Under, Fantasia 2000, Winnie the Pooh (2011), and now, Ralph Breaks the Internet, sequel to 2012’s delightful Wreck-It Ralph. Though considering the Pooh movies work more like standalone episodes, and the Fantasia films are non-narrative, there could be an argument that Ralph Breaks the Internet is only the studio’s second animated sequel. No matter how you look at it, however, Ralph Breaks the Internet proves to be the best sequel Disney has yet made by an incomparable margin, and arguably the best Disney animated film since Frozen. Ralph Breaks the Internet is set six years after the original (coinciding with the real gap between films). Wreck-It Ralph (John C. Reilly), the lovable video game ‘villain’ of Fix-It Felix Jr., has become something of a surrogate brother to Vanellope Von Schweetz (Sarah Silverman), a character from the cutesy, Mario Kart-esque racer, Sugar Rush. Ralph and Vanellope spend the days in their respective arcade games, while at night they jump from game to game goofing off. Ralph, having spent years as an outcast due to his role as a video game baddie, is perfectly content with his life now that he has a friend. Vanellope, meanwhile, wishes for something more out of life, feeling that her game is too simple, and her time with Ralph too routine. Luckily for Ralph and Vanellope, however, Mr. Litwak has recently installed wi-fi in the arcade. And so Ralph and Vanellope sneak into the arcade’s wi-fi router, in hopes of traveling into the internet to find eBay and buy a new Sugar Rush wheel so that Vanellope (and all the other now-homeless Sugar Rush characters) can go home. Of course, being video game characters, Ralph and Vanellope don’t exactly know what they’re getting themselves into, and their ensuing adventure may just test their friendship. It sounds like a simple setup, but like the other recent Disney films, Ralph breaks the Internet tells a story that’s made complex by the characters. Gone are the days when Disney simply utilized their stock archetypes to push plots forward, Disney’s recent output have told stories dictated by the characters, not the other way around. And Ralph Breaks the Internet continues this trend in a unique way. Being a sequel, Ralph 2 could have easily fallen into the pitfall of recycling the original’s material under a new guise. 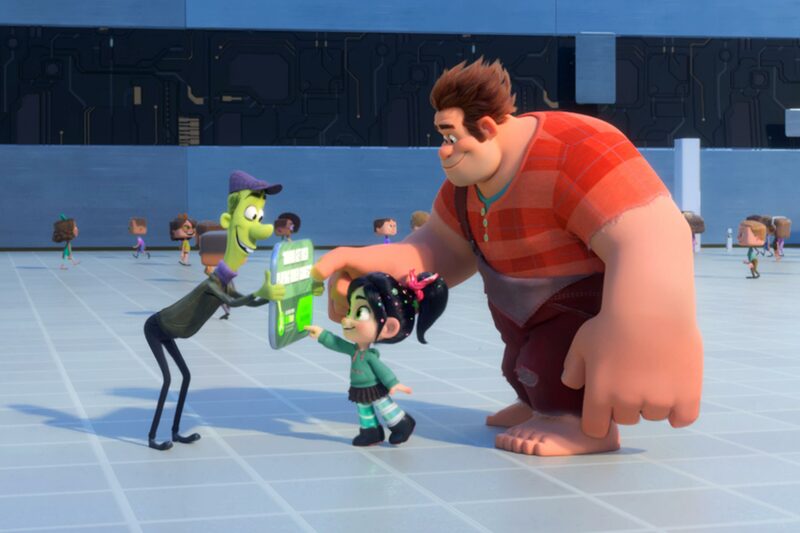 Instead, Ralph Breaks the Internet uses its position as a sequel to build on the characters we grew to love the first time around, and give them new dimensions. In turn, this sequel may actually outdo its predecessor in the emotional department. 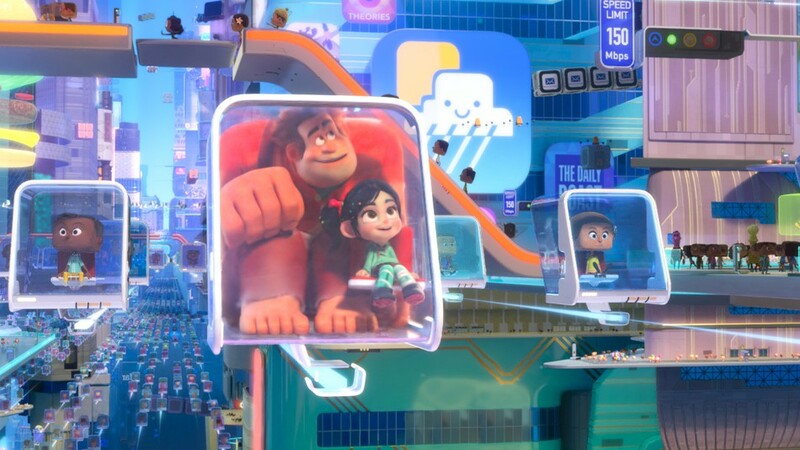 Like the first film, Ralph Breaks the Internet uses its premise to create a wide array of different visual styles and art directions. It’s easy to go into the film being skeptical at the change in focus from the video game theme of the original to the internet theme of this sequel, but Ralph Breaks the Internet finds ways to make it work. With so many different worlds to explore – whether it’s the returning Sugar Rush or Fix-It Felix Jr., the internet itself, Slaughter Race, the dark web, or the worlds of Disney – Ralph Breaks the Internet continues what the first film started by making an animated feature that’s constantly rebuilding itself on the visual front. 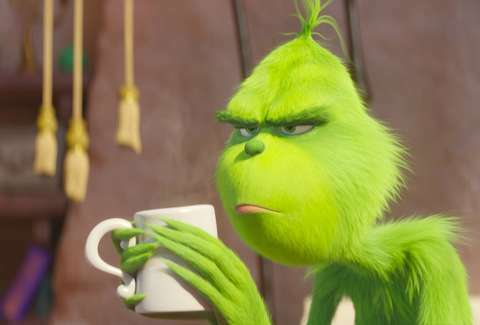 The Wreck-It Ralph movies are so good I’d love to see a third entry, but I wouldn’t mind a third one even just to see what other visuals they can come up with. Like the first movie, Ralph Breaks the Internet also features a memorable musical score that channels the video games that inspired it. And this time around, we even get a big musical number, which is another highlight of the film. Another interesting change of pace from Disney norms is that Ralph Breaks the Internet doesn’t have any real villain. It seems like Disney’s recent flicks have been doing new and different things with their villain scenario, finding ways to make them key to the plot without being the center of it like the Disney of old. 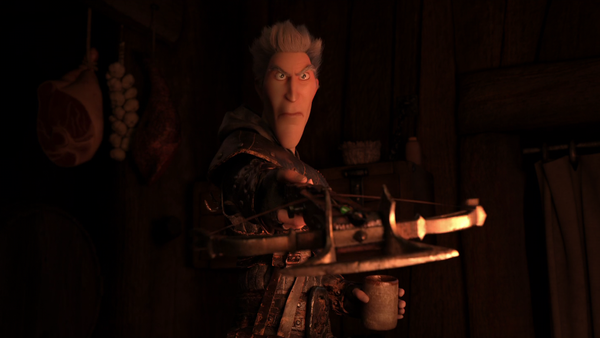 And now Ralph 2 seems to just throw the villain element away entirely. As stated, this is a movie about Ralph and Vanellope, and they end up creating their own dilemmas for themselves (whether through conflicting interests or well intentioned accidents). There’s something really refreshing about that. If there are any issues with the story, it might simply be that it can feel like it takes a fair bit of time to get going. As stated, searching for a video game steering wheel doesn’t exactly sound like it makes for a great adventure, and you may wonder where exactly the film is going for a while (albeit the charming characters and witty writing might make you not care), but once it picks up, it’s a consistently entertaining and heartwarming picture. Fans of the original film may also lament that returning characters Fix-It Felix Jr. (Jack McBrayer) and Sergeant Calhoun (Jane Lynch) have largely reduced roles. After marrying at the end of the first movie, Felix and Calhoun end up adopting all of the Sugar Rush racers (sans Vanellope) once their game gets unplugged. It had the potential to be a pretty funny sub-plot, but sadly it gets very little time overall. New characters include Shank (Gal Gadot), a badass chick from Slaughter Race, Knowsmore (Alan Tudyk, who’s omnipresent in Disney animation these days), a search engine, Yesss (Taraji P. Henson), an algorithm on a YouTube-esque site, and J.P. Spamley (Bill Hader), a clickbait pop-up advertisement. With the exception of Shank, most the new characters don’t have too big of roles. 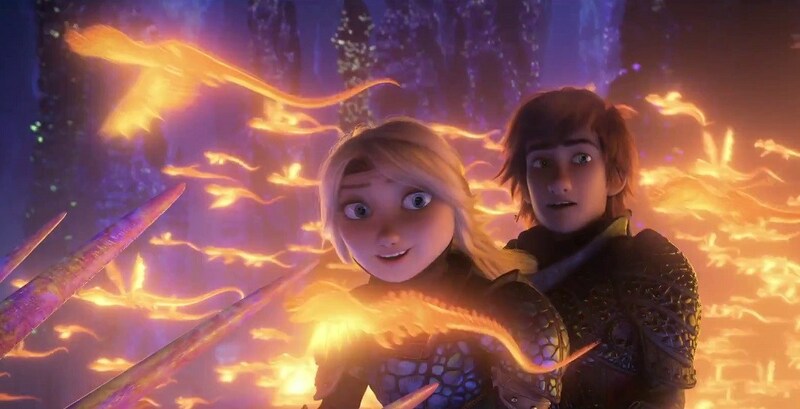 But they all help push the main plot forward with Ralph and Vanellope’s journey, so they don’t feel underutilized in the way Felix and Calhoun do with their own sub-plot. 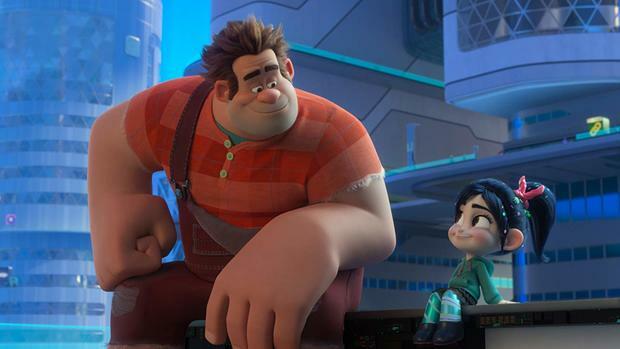 In the end, what makes Ralph Breaks the Internet such a winner is that it is a heartfelt story between its two main characters that helps them change and grow in a way a lot of sequels are afraid to do. It doesn’t simply continue what its predecessor started, but builds on it. 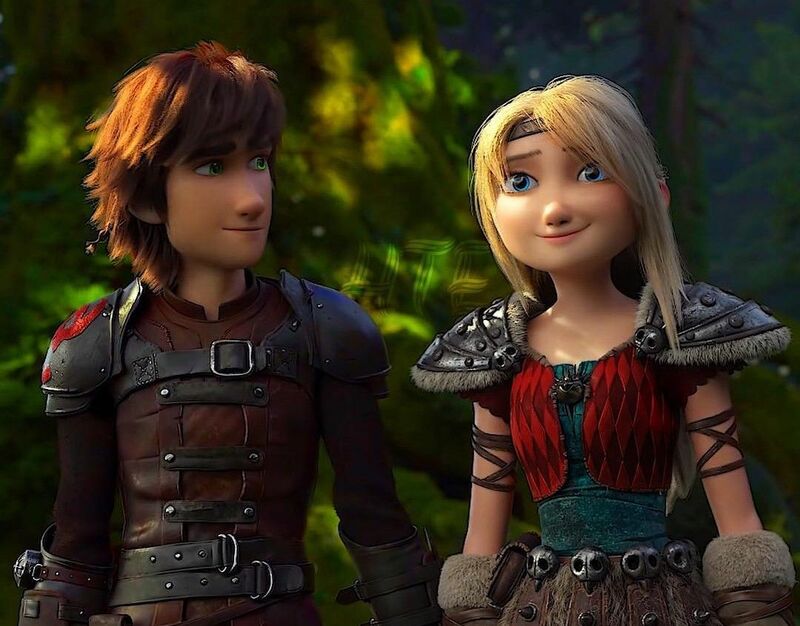 The change in setting from video games to the internet may have been cause for concern going in (because really, which one seems the more fitting setting for an animated film? ), but the story and characters win you over so strongly the change seems inconsequential. 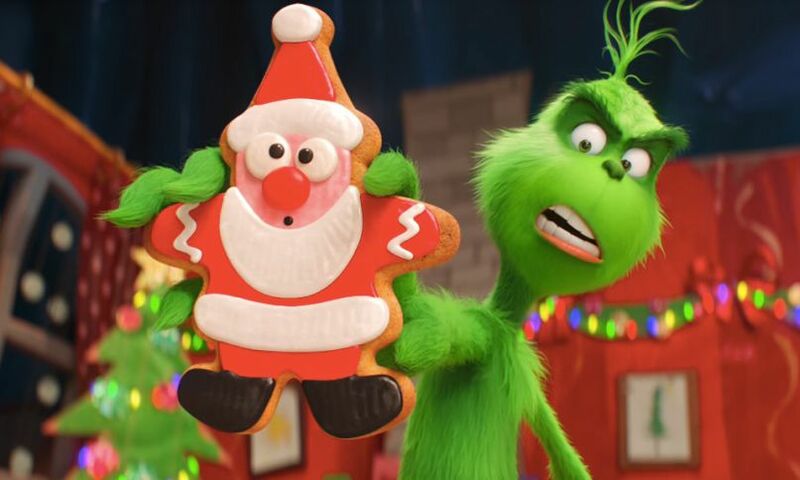 It seems a lot of CG animated films are defined by their setting – emulating the ‘themed movie’ approach of Pixar films without understanding the deeper story aspects – but Ralph Breaks the Internet lets its characters take the steering wheel, ultimately telling a story that delivers in entertainment and emotion, with a pretty heavy and mature message about friendship that may bring a tear or two to your eye. Disney has rarely created proper sequels to their animated classics. But Ralph Breaks the Internet puts up a good argument that they should do it a little more often. It may have a slow start, but Ralph Breaks the Internet is a prime example of what a sequel should be. Fingers crossed that Frozen 2 can do the same. The Cat Returns was always one of Studio Ghibli’s smaller features. 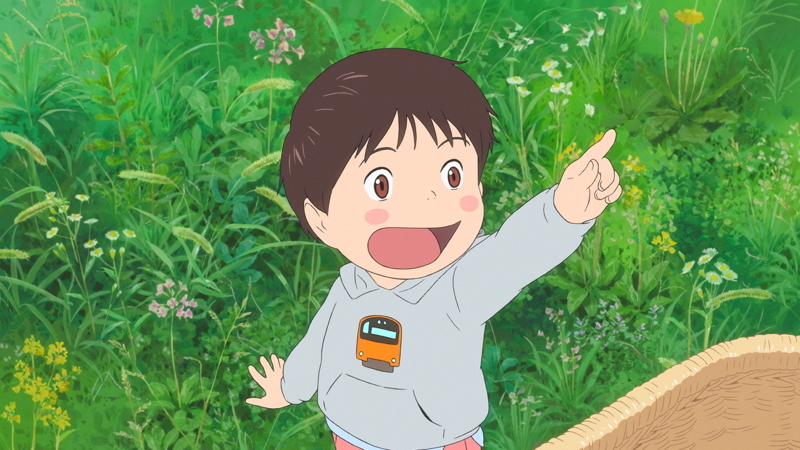 As only the studio’s second animated film not to be directed by either Hayao Miyazaki or Isao Takahata, The Cat Returns was aiming to be a means to groom a new director for the studio, Hiroyuki Morita. Strangely, The Cat Returns remains Morita’s sole feature film as director. While Morita may not have become the successor to Miyazaki or Takahata, his single feature remains a delightful if small-scale installment in the Studio Ghibli canon. 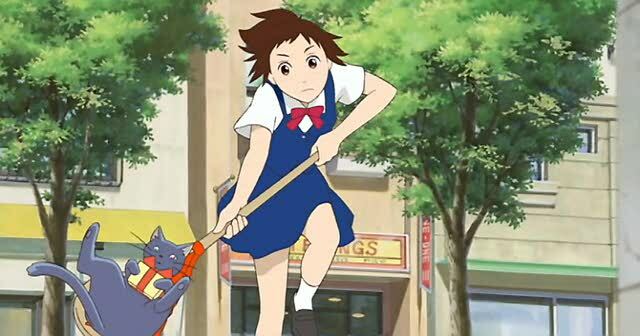 The Cat Returns tells the story of Haru, a Japanese high school student. She’s shy, quiet, and a bit clumsy, not to mention she tends to be late for class and other events. Basically, she’s the most uneventful student at her school. That is until one day when she saves the life of a cat that’s about to be hit by a truck. This cat turns out to be Prince Lune, the prince of the Cat Kingdom, who begins to speak to Haru and thanks her for her bravery, much to Haru’s astonishment. That night, a parade of cats – which includes the Cat King himself – visit Haru at her home. They tell her that for her actions, she will be showered with gifts. Though these gifts are more cumbersome than anything, and include boxes of live mice (the cats being unaware of the difference between human and cat diets) as well as planting cattails (which Haru happens to be allergic to) all over her front yard. Things get even weirder for Haru when she learns that the Cat King has decreed that she will marry Prince Lune! Understandably not wanting to marry a cat, Haru is desperate for a way out of the situation, as the cats seem entirely naive to her objections. Suddenly, Haru hears a mysterious voice that tells her to seek out a “big, white cat,” who will lead her to the “Cat Bureau.” Haru finds the obese feline, a marshmallowy cat named Muta, who guides Haru to the Bureau. There, they meet Baron Humbert von Gekkingen (or simply “The Baron”), a magical cat figurine who comes to life when people seek his help. Soon after meeting the Baron, Haru and Muta are whisked away to the magical world of the Cat Kingdom, with the Baron and his ally Toto – a crow statue who comes to life similar to Baron – giving chase to save Haru from becoming a cat herself. It sounds like a silly plot, and that’s because it is. But it’s also sweet, charming, and has a bit of heart to it. It has a nice message of being true to yourself, and it’s often hilarious with characters (particularly Muta and the Cat King) and its visual gags. Of course, being a film made to groom a new director, The Cat Returns is one of Studio Ghibli’s simplest films. It barely exceeds the hour-long mark by ten minutes, and just feels like a much smaller-scale picture than most other Ghibli features. There’s nothing inherently wrong with The Cat Returns, but when compared to the usual standards of Studio Ghibli, it does feel relatively uneventful. It’s also of note that The Cat Returns was the closest thing Ghibli made to a sequel to one of its feature films. The characters of Muta and the Baron were originally featured in Whispers of the Heart (ironically the studio’s previous attempt at grooming a new filmmaker). Though the stories are largely unrelated, with the popular belief being that The Cat Returns is a story written by the protagonist of Whispers of the Heart, who was an aspiring author. 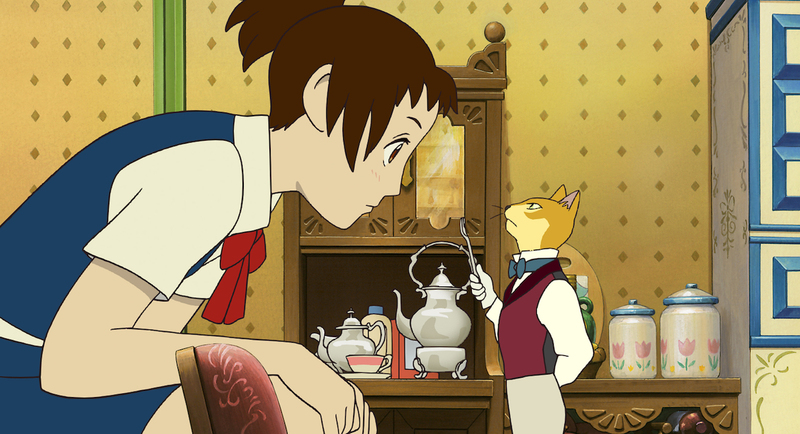 The Cat Returns doesn’t quite match Whisper of the Heart, but it does serve as a fun, quasi-continuation. Not being a Studio Ghibli masterpiece is hardly a complaint, however, as everything that is here in The Cat Returns is quite charming, and it’s all too easy to be won over by it. The Cat Returns is the kind of movie that’s impossible not to smile at. Along with the fun and whimsical story and the cute characters, The Cat Returns features some truly stunning animation. 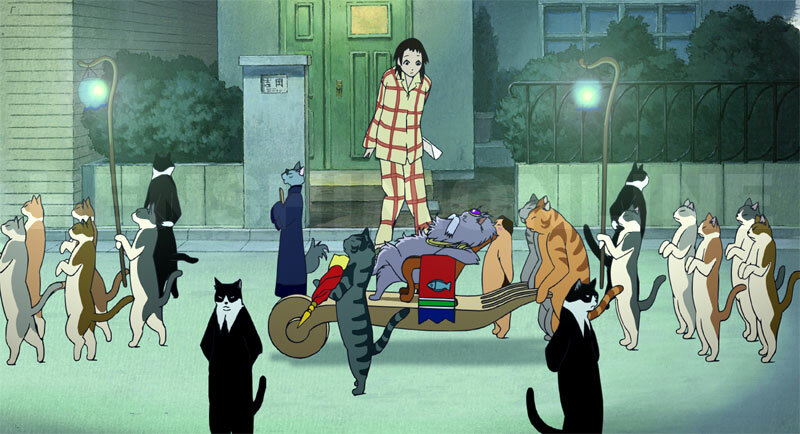 Though a Ghibli film having fantastic visuals is stating the obvious, The Cat Returns boasts a unique look for the studio. The Cat Returns looks akin to a Mamoru Hosada film, with simple and clean character designs that are its own. The character movements are smooth and fluid, and every last scene is filled with life and color. The Cat Returns is simply a joy to look at from the very first frame. Complimenting these visuals is a soundtrack that is somehow both energetic and soothing. It may not rank alongside Joe Hisaishi’s compositions for the best Miyazaki films, but the music by Yuji Nomi is a joy to listen to, and really adds to the film’s dreamlike qualities. Per the norm, The Cat Returns also features a stellar English dub. 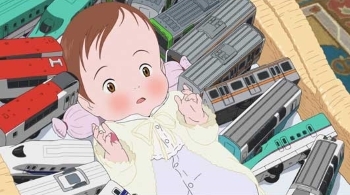 Anne Hathaway provides the voice of Haru, and gives the heroine a strong sense of believability and sympathy, while still hitting the right comedic notes when necessary. Cary Elwes voices the Baron, providing all the dapper British charm you could hope for, while the late Peter Boyle adds a good deal of comedy to his portrayal of Muta. And Tim Curry provides the gravely, somewhat lecherous voice of the Cat King. It goes without saying that Tim Curry is brilliant. The Cat Returns may be a small film by Ghibli’s staggering standards. But it’s an undeniable charmer that will entertain audiences both young and old. It should leave you with a big grin beaming across your face and a warm feeling in your heart by the time the credits roll. Spider-Man: Into the Spider-Verse is some kind of revelation. A western animated feature that creates a visual look that’s completely removed from the Pixar style that has remained the basis of the medium for over two decades and, even more notably, a super hero film that’s wildly original. Into the Spider-Verse is not only the best Spider-Man film since 2004’s Spider-Man 2, it’s one of the best Marvel movies period, and one of the best films of 2018. The first thing audiences are bound to notice about Spider-Man: Into the Spider-Verse is its animation. Simply put, this is one of the most uniquely animated films ever made. It emulates the look of a comic book in a way no live-action film ever could. Although Spider-Verse is computer animated – as is the standard of today – it combines it with traditional hand-drawn techniques, and a unique cel shading to give it its aforementioned comic book vibe. It’s quite stunning to behold in motion. Perhaps the best thing about Into the Spider-Verse is that its story nearly matches its visuals in the originality department. 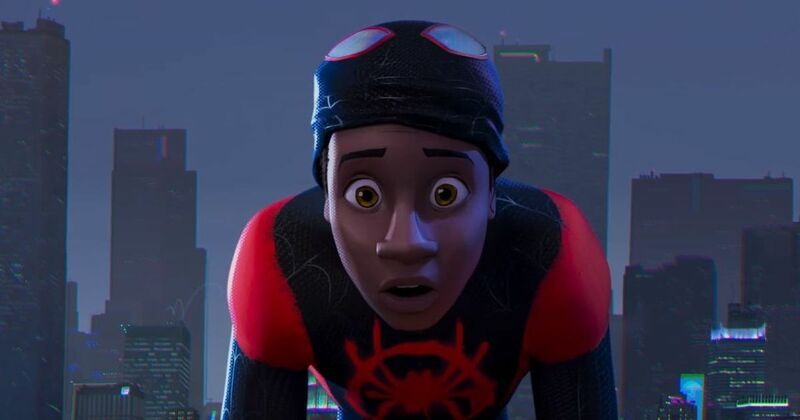 Spider-Verse tells the story of Miles Morales (Shameik Moore), a teenager who, like the more widely known Peter Parker, is bitten by a radioactive spider, which grants him super human strength and agility, as well as a ‘spider sense’ that alerts him to danger. Sure, it doesn’t matter who is behind the Spider-Man mask, we all know the origin story so well any reminder of it comes across like a joke. And in fact, Into the Spider-Verse makes the origin story into its biggest running gag. Yes, we do see how Miles Morales becomes the famous web-slinger, but the tale is given more than a few new spins. For starters, the Peter Parker Spider-Man (Chris Pine) already exists by the time Morales gets bit by the fateful arachnid. And soon after Morales gains his powers, he stumbles across an epic battle between Spider-Man and the forces of the Kingpin (Live Schreiber), which include the Prowler and the Green Goblin (whom, in this highly stylized version, is an actual goblin-like monster). The plot gets an extra dose of originality by how Miles (and by extension, the audience) just kind of happen upon Kingpin’s evil plot as it’s unfolding, instead of having a good chunk of the first act dedicated to explaining Kingpin’s plans. What Miles stumbles on, however, is Kingpin’s attempts at opening portals to other dimensions. Though the machine used to achieve these means collapses on itself – causing great damage to New York City and even wiping out some of Kingpin’s forces – it does succeed on a small scale, allowing the Spider-Man equivalent of five other dimensions to enter Miles’ world. These ‘Spider-People’ include a cynical, down-on-his-luck Peter Parker (Jake Johnson), who is divorced from Mary Jane Watson and quite out-of-shape, and becomes a disinterested, reluctant mentor to Miles. There’s also Spider-Woman (Hailee Steinfeld), the Gwen Stacy from a separate dimension, who took up the Spider-Mantle in place of her friend Peter Parker, who was killed in her world. 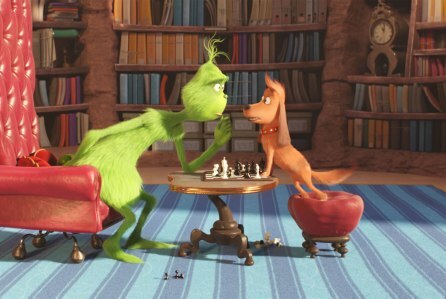 These two, along with Miles, make up the film’s primary characters. 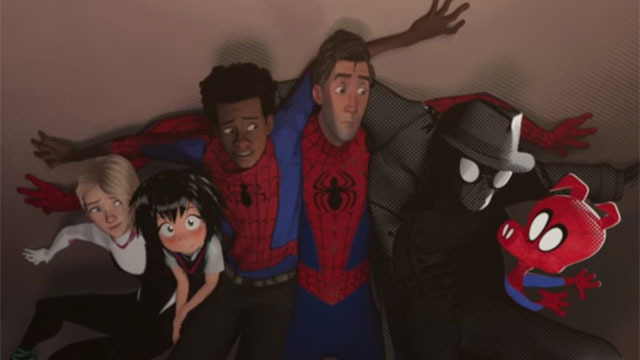 Though another trio of Spider-Men join the fray later on: Spider-Noir (Nicholas Cage), a gumshoe from a 1930s dimension; Peni Parker (Kimiko Glenn), a Japanese female Peter Parker from an anime universe with a spider-mecha; and Peter Porker/Spider-Ham (John Mulaney), a pig from a slapstick cartoon universe who, in contrast to the rest of the group, was originally a spider before being bitten by a radioactive pig. As you might expect, it becomes the mission of Miles and his newfound Spider-Friends to prevent Kingpin from reactivating his machine and completely destroying New York City. Admittedly, it is a bit of a shame that the latter three characters don’t get nearly as much screen time, seeing as they bring out the most style in this most stylized film. 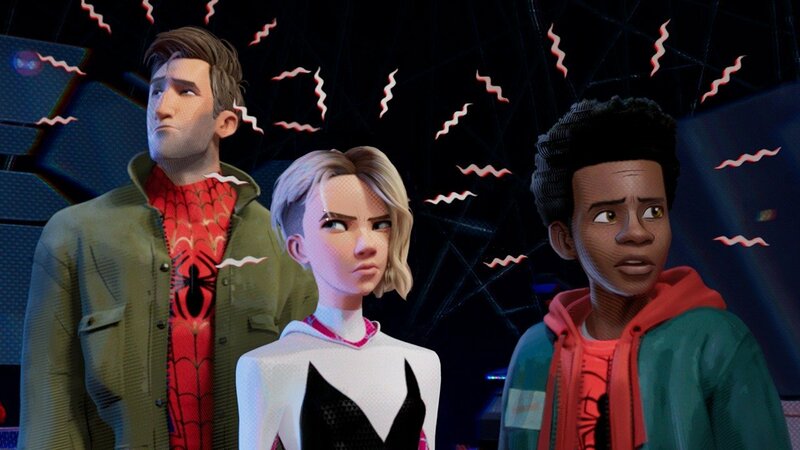 But I suppose sequels and spinoffs are already in the tank, so here’s hoping Spider-Noir, Peni Parker and Peter Porker can all star in their own movie, which can take advantage of their wildly different styles. Though hoping that the secondary heroes can get their own sequel is hardly a complaint, and is more telling of just how wonderfully realized Into the Spider-Verse’s heroes are that even the supporting cast leaves such an impression. If there is one element that is a little disappointing, it’s in the film’s villain scenario. Kingpin is actually given a pretty unique motivation for a super villain, but his story ends up suffering slightly as it never really evolves beyond its initial reveal. Perhaps an even bigger misstep is that many of Spider-Man’s best villains, like the aforementioned Green Goblin and even Doctor Octopus, really end up feeling shortchanged as mere henchmen of Kingpin. Spider-Verse has some unique ideas for these villains, but by giving them bit roles, they feel wasted. Spider-Verse has an ace up its sleeve in regards to sequels in that, by introducing alternate universes, this series can continually reinvent these villains and promote them to the primary antagonist role. Though you do have to worry that the filmmakers may not go that route since they already used said villains. These are ultimately small prices to pay for an otherwise stellar movie. Spider-Man: Into the Spider-Verse continuously finds new ways to reinvent not only Spider-Man, but the super hero movie genre as a whole. It’s briskly paced, throwing Miles Morales’ story into the grander plot without slowing down for the usual super hero expositions. And the film is a constant barrage of style and flashy visuals. 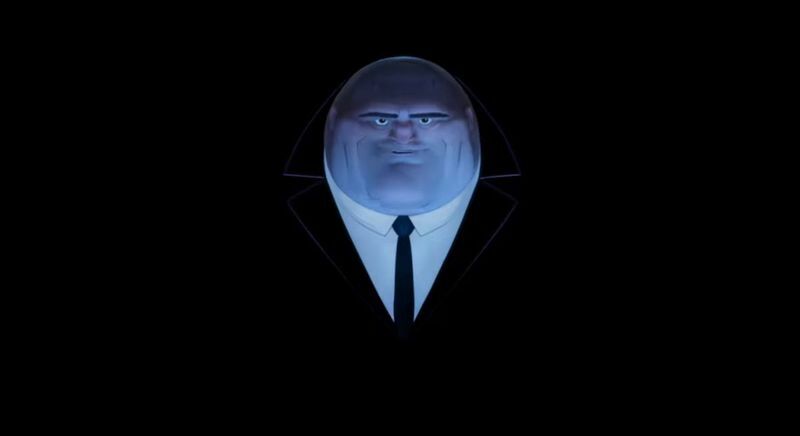 There’s not a single moment in Into the Spider-Verse that doesn’t burn its way into your memory with its flashy colors, vibrant effects and fun character designs (Kingpin in particular, with his massive body and relatively small head, looks like he walked out of a Sylvain Chomet film). It’s the most uniquely animated film since The Tale of the Princess Kaguya. In this day and age, where super hero films are a dime a dozen, Spider-Man: Into the Spider-Verse stands above its contemporaries by creating a super hero tale that looks and feels stunningly original. Into the Spider-Verse tells a story that makes one of pop culture’s most enduring heroes feel fresh all over again, and it does so with every last frame being drenched in style. Mirai, the latest animated feature from Mamoru Hosoda, is one of those movies that combines the simple joys of life with the fantastic and surreal. While Hosoda’s last film, The Boy and the Beast, was a delight in its own right, its later half seemed to fluctuate with what kind of story it wanted to tell, with its wonderful monster world being largely forgotten for a lengthy stretch of time, and a final battle that felt like it was from another movie. By comparison, Mirai feels a lot more focused and consistently true to itself. 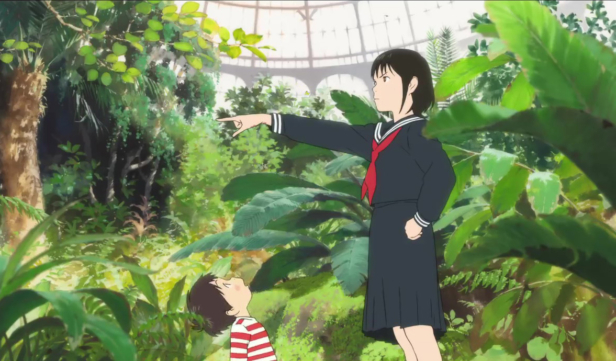 And while Mirai may suffer from an occasional slump in pacing, it ultimately provides one of the most charming anime films in years, and one of the best films of 2018. 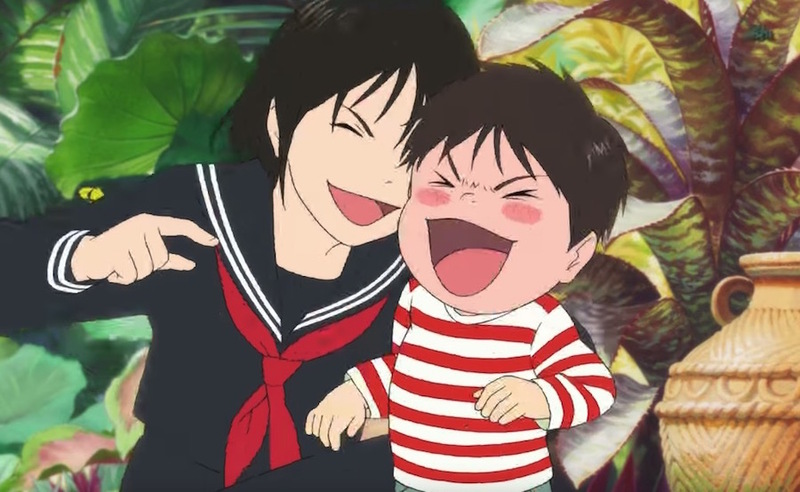 Mirai tells the simple but timeless story of a young boy growing jealous of all the love and attention his new baby sister receives from his parents. The boy is Kun, a rosy-cheeked child who loves to play with his dog Yukko and has a strong interest in bullet trains, with toy models of them strewn about his room. His newborn sister is Mirai who, like all newborns, understandably starts taking more and more of their parents’ attention. Of course Kun, being a young boy, doesn’t quite understand the situation, and only knows that he’s getting less attention from his parents. This, of course, means that Mirai is a story about Kun becoming a more responsible and loving big brother. As stated, it’s a tried-and-true, though timeless, storyline. But Mirai is able to make a unique identity for itself by the ways it tells its story. The film does a fantastic job at telling its story through a child’s perspective. For example, the only named characters are Fun, Mirai and their dog Yukko. The parents are only ever referred to as ‘Mom and Dad,’ even in the end credits. And the remaining characters consist of Grandma and Great Grandpa. 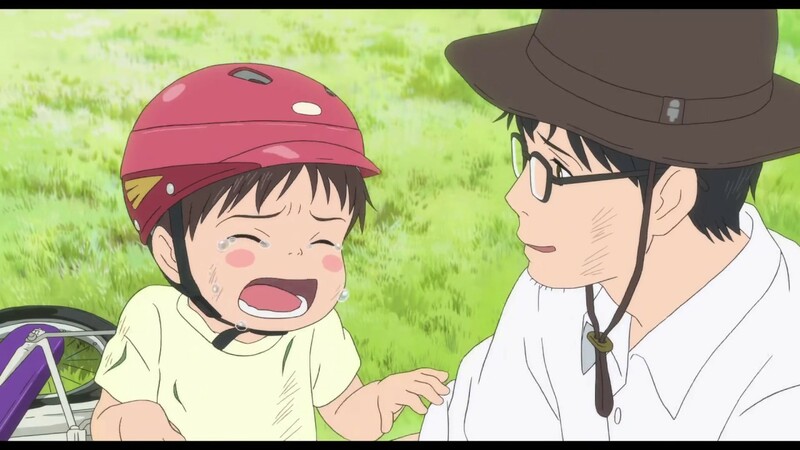 Mirai puts audiences firmly in the children’s viewpoint, which really adds to how the film turns rather simple, mundane events into something fantastic. Mirai features a number of fantasy elements, which may be real or simply creations of Kun’s imagination. The most notable being that Kun meets up with an older Mirai from the future, who needs Kun’s help in a few different instances, as she can’t directly affect moments from her past. Fun also meets a human version of Yukko, a child version of his mother, and his recently deceased great-grandfather during his younger days. As stated, whether these elements are literal or allegorical is up for interpretation, but they do all have a common thread. The house in which Kun and his family live is as much a character as any of the humans (or the dog) in the film. Built by Kun’s now stay-at-home architect father, the house of the film – much like the house in anime classic My Neighbor Totoro – is one of those places from the movies that really stands out, and you’ll vividly remember. A doorway leads to a stairway leads to a garden leads to the house which, in itself, is a series of small rooms on top of each other like a staircase. But it’s whenever Kun exits the house and into the garden that the seemingly supernatural elements take place. There’s never a reason given why this happens, which always feels infinitely refreshing in this day and age when movies feel like they want to hand deliver an explanation for everything to the audience. 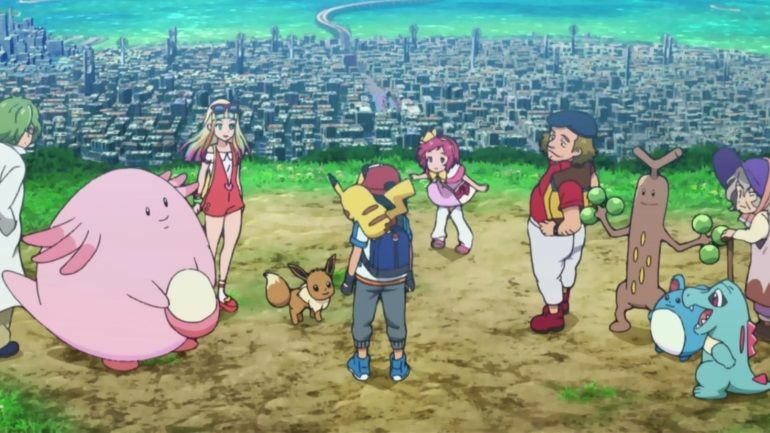 Mirai mostly plays out like a series of episodes, each one bringing a different otherworldly occurrence to Kun, and each helping him grow and learn his role as a big brother (even when his baby sister from the future is older than he is). On the downside, some of these ‘episodes’ can drag on a bit. 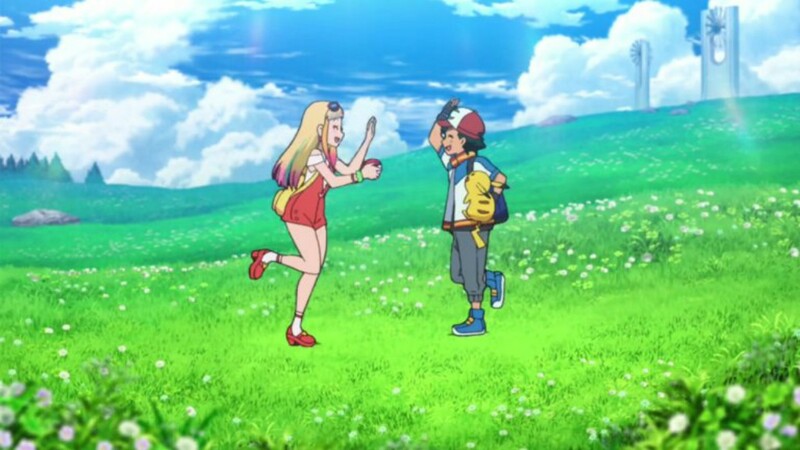 This isn’t too noticeable at first, but when you realize that the future version of Mirai isn’t in the film all that much, it does feel like a little bit of potential is missed in the film’s most unique element to its core brother-sister relationship. 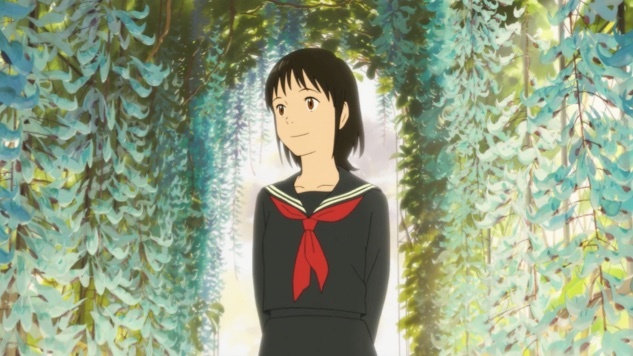 The inconsistent pacing is a small price to pay, however, for how charming and sweet Mirai ultimately is. The characters are believable and easy to sympathize with (again, Kun is just a small boy, so his jealousy for his baby sister never comes across as petty, just a confused child who doesn’t understand the change around him). 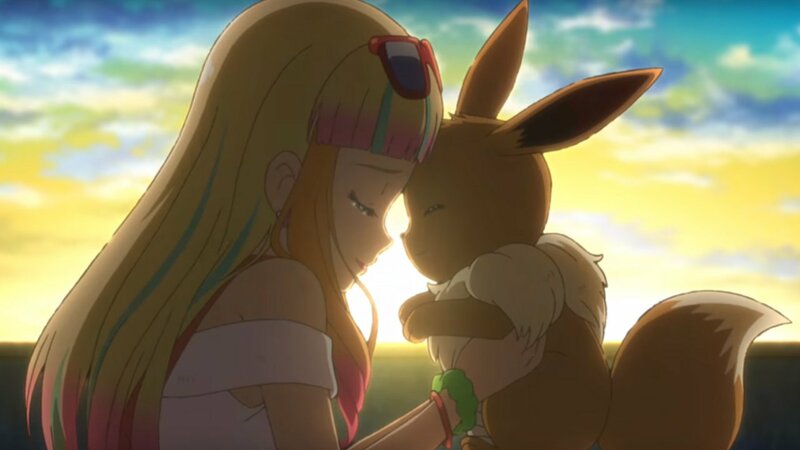 And as stated, it’s unique to see him interact with a future version of his sister, as the older Mirai appropriately reacts to Kun as someone she’s known for many years, while also remembering she’s speaking to a child version of her older brother. It’s the same kind of topsy-turvy take on familiar relationships that made Your Name feel so unique. 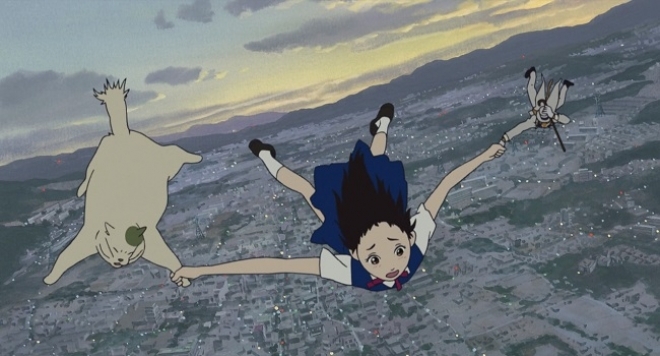 Much like Hosoda’s previous work, Mirai is an absolute marvel in the visual department. Featuring some of the most fluid animation in years, as well as some of the most charming character designs, Mirai is instantly pleasing to the eyes. And it only grows into more and more of a visual spectacle as it goes, and Kun finds himself in even more otherworldly encounters. While the CG wonderlands we’ve grown accustomed to in animation are also eye-striking, there’s an ethereal element to traditional, hand-drawn animation that just feels so mesmerizing – maybe even uplifting – to look at. It’s great to see the world of anime keep traditional animation alive, and Mirai is among the best looking ones. Although animation in the west is often stigmatized as exclusively child’s fare, it really is a medium that can present stories for any audience. And films like Mirai sum that up on their own. Mirai is simple, sweet and cute enough to delight children. But it’s also complex and deep enough to hold any adult’s interest. Mirai is simply a wonderful movie.